1992 | You can bring Pearl, she's a darn nice girl but..
You can bring Pearl, she’s a darn nice girl but.. I am aware of the fact that it is uncommon for a person to get their first car at 30 years old but I am here to tell you, it happens. A couple of short weeks before my 30th birthday I purchased my very first vehicle. 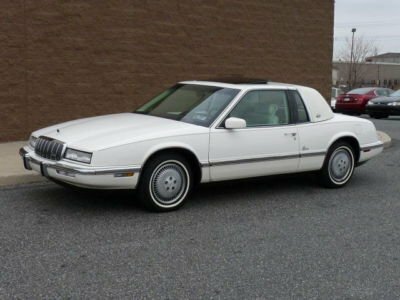 A 1992 Buick Riviera. This is not my actual car, but it is exactly what it looks like. As a teenager, I had little to no interest at all in learning to drive. While the majority of my peers were learning the rules of the road and getting their licenses, the very thought of getting behind a wheel and having faith in the other people on the road made my stomach turn. I somehow got by getting to all the places I needed to go. When I was 20 years old, I moved to a large city where all I needed was my bicycle and a bus pass and I could get anywhere, basically anytime. For the most part, everyone I hung out with used the same methods of transportation. When I would say that I did not have a car there was no reason for disbelief because there are so many options to get from Point A to Point B.
I am back in my hometown. The public transportation, while it exists, is not a popular choice. In fact, I cannot think of a single person I know in town that I can say uses it regularly. My husband and I were fortunate enough to be able to share a car for the first year of living here. Our work schedules and locations coordinated just enough to make it work. He changed jobs and it no longer made sense. I was on the hunt! I combed Craigslist, the classifieds in the newspaper, used car websites and anything else that I could get my hands on. I have a limited budget and knew if I waited long enough the perfect car would find its way into my life. I spent countless nights wishing cars were just a little less money, had less miles, were automatic and not manual, didn’t need more work than I was willing or able to give it or were not hundreds of miles away. Eventually, my Riviera was available on Craigslist. My hubs and I went to test drove it and I immediately knew that this was going to be my first car. I did not realize how much freedom I was missing out on! I can come and go whenever I please! As someone who hitched rides with people in the past, I am trying to even things out and when people need rides I am more than willing to give them. It feels good to be able to do things like that. It seems like it would not be that big of a deal but spending my entire life up to this point unable to do so, it brings me a sense of joy. It is my way of giving thanks to anyone who has ever went out of their way to make sure I got to wherever it was I needed to be.